NGenE selects up to 40 advanced graduate students and postdocs from around the country to partake in what is an intense week-long summer workshop that explores advanced topics in electrochemistry. They spend five days with ten distinguished researchers and lecturers to identify and elaborate on the most important unsolved electrochemical research challenges. They approach these questions through lectures and discussions, research project planning, mentoring, site visits, and demonstrations. The program takes place at the University of Illinois at Chicago, with a day trip to Argonne National Laboratory for lectures and demonstrations of the Advanced Photon Source and the Joint Center for Energy Storage Research's Electrochemical Discovery Laboratory. The program prioritizes 1) the discussion of unsolved challenges in electrochemistry that the coming generations will need to address, and 2) the identification of representative innovative, forward-looking multi-modal experiments, theory, and simulation to solve them. Participants are active players during NGenE. Working in teams, they choose one of the top unsolved challenges in electrochemistry and then develop a scientific program to solve the problem through innovative experiments and theory. On the final day of the program, each team presents their findings before their peers and a set of expert judges. Electrochemistry – the manipulation of electrical charge to drive chemical change – is central to applications and devices in fields as varied as medicine, environmental remediation and energy, and integrates concepts spanning chemistry, physics and engineering. Despite its reach and importance, electrochemistry has advanced more slowly over the last two decades than many companion fields such as nanoscience or semiconductors. Next Generation Electrochemistry (NGenE) will focus on the existing and emerging challenges in electrochemistry, and the application of innovative strategies in synthesis, characterization, theory and simulation to address these challenges. NGenE is an annual event with content rotating among the unsolved fundamental electrochemical challenges and applications. Students and lecturers spend significant time talking and developing relationships that – we hope! – may become long term mentor-protégé bonds. The most talented students may return for subsequent institutes. 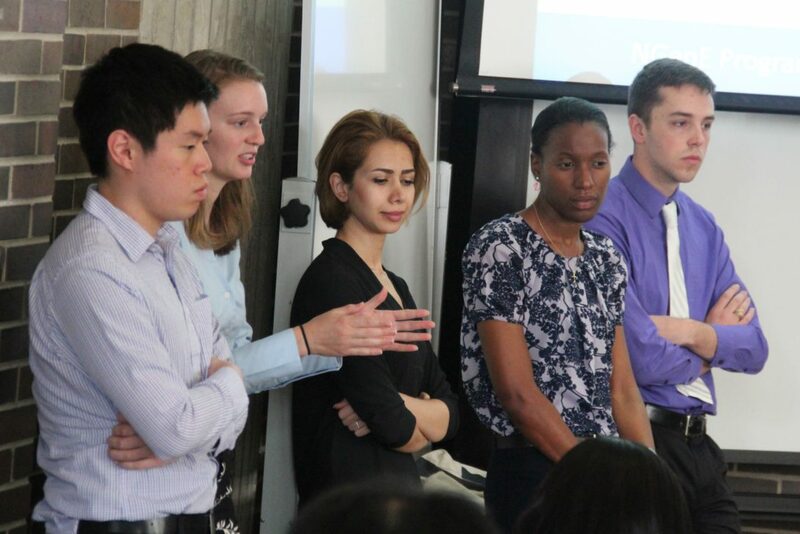 With over 30 students per year, NGenE aims to influence the strategic directions of electrochemical science in the United States in the decades to come. What are the most important unsolved issues in a given area of electrochemistry? What do we know for each part and how do we know it? What do we want to know but do not know, and how we would go about finding it out? What intuition or experience guides our speculation about what could happen? Electrochemistry is central to fields as varied as energy storage, water treatment and neuroscience. However, the concepts that underlie the research barriers in this field are often similar, meaning that they can be tracked back to a core challenge in electrochemistry. In turn, the knowledge of electrochemistry developed for one field could offer clues for new research directions in other fields. NGenE 4.0 aims both to foster cross-pollination of ideas from seemingly different fields linked by electrochemistry and to identify fundamental challenges that transcend fields, pointing at research directions with potential for very broad impact. Faculty will present both our current gaps in understanding of important electrochemical processes in different sub-disciplines, and emerging strategies to add detail with the highest possible chemical, temporal and spatial definition. They will lay out a series of critical unresolved questions that must become the priority of the next generation of electrochemists, motivating their importance through experience and future societal needs. Emerging approaches to probe and model electrochemical phenomena will naturally become a focus of the lectures. There is no cost to apply or attend the program, and travel and lodging support is available to participants. For more details, please contact Thomas Alaan at talaan@uic.edu. Participants must apply and be accepted into NGenE to participate. The online application (found here) requires 1) a LinkedIn profile, 2) two essays, 3) supporting documents demonstrating research in frontier electrochemistry, 4) contact info for your supervising instructor, and 5) a resume or CV. Incomplete applications will not be considered. All applications must be received no later than May 1, 2019.